The concept for a Nashville MLS stadium site plan continues to evolve, with some key changes to the proposal recently unveiled. 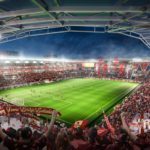 Nashville is slated to construct a new soccer-specific stadium at The Fairgrounds Nashville that will accommodate an MLS expansion franchise. The $275-million facility is part of a larger project, with a 10-acre private mixed use development and new fairground event buildings also factoring into plans for the site. A future 10-acre private mixed-use development — to be operated by the MLS franchise’s owners led by businessman John Ingram — would be located on the elevated portion of the fairgrounds directly next to the stadium under the proposal. This part of the property had previously been envisioned for new fairgrounds event buildings and an expo center to be rebuilt on the site. In a reversal, the fairgrounds facilities — which hold flea markets and other events — would now be constructed on the lower elevation part of the property, totaling 21 acres, near what is currently Walsh Road, close to Nolensville Pike. This is where the mixed-use development was originally shown before the Metro Council approved a bond resolution for the MLS stadium at the fairgrounds last fall. Final recommendations for the new fairgrounds master plan were unveiled before a crowd of about 100 people Tuesday night. It followed a two-week community input process with workshops on how the revamped fairgrounds should look and function. Laura Womack, executive director of the fairgrounds, said the decision to flip locations was made due to three reasons: timing considerations to allow the expo center and flea market to hold events while the stadium is under construction; the ability for the fairgrounds to host events simultaneously once everything is built; and because it’s cheaper to build on a flat surface instead of the hilly area next to the stadium. Nashville’s MLS expansion bid was formally approved by the league in December, after the Nashville Metro Council voted in favor of $225 million in bonding for the stadium project. However, there are additional steps to be completed in the planning process, including demolition of existing buildings at the fairgrounds and re-zoning to accommodate the development that will surround the stadium. The new Nashville MLS expansion franchise will be owned by Nashville Soccer Holdings, LLC, led by John Ingram of Ingram Industries, and backed by a group that includes Minnesota Vikings (NFL) owners Mark, Zygi and Leonard Wilf, and the Turner Family of Nashville-based MarketStreet Enterprises.